This earlier post on rationing in wartime discusses the change in eating habits and heating methods, and now we’ll look at some recipes that filled the newspapers and cookery books of the day. Cut up small one bundle of leeks, wash, and place them in salted boiling water. Let boil twenty minutes, and drain thoroughly. Cut up one pound of salt lean pork in small equal pieces, boil for twenty minutes in enough water to cover; then empty meat and liquor into a deep greased pie-dish; add leeks, half a breakfastcupful of soaked drained crumbs, one beaten (dried) egg, and mix thoroughly. Cover with a potato crust and bake for one hour in moderate oven. Remove the head, clean and trim the fish, lay it in a fireproof dish, with a sprinkling of pepper and salt and two ounces of margarine or dripping cut small. Let it bake for twenty minutes in a moderate oven. Fry four chopped mushrooms, lay them evenly on the fish, bake ten minutes more, and serve in the same dish. 1/2 lb flour, 1/4 lb porridge (made by cooking 1 oz oatmeal in 1/2 pint water until a very stiff porridge), 1/4 oz yeast, 1/2-1 tsp salt, 1/2 gill warm water. Cream the yeast with a little of the warm water. Mix all the ingredients together, add more water if necessary, and knead well on a floured board. Keep in a warm place until the dough is about double in size. Knead again lightly and put into a floured tin. Set in warm place to prove for about 1/2 to 3/4 hour. Bake in a hot oven. (Note.–I give this recipe for completeness sake; but it is rather reckless unless you have a lot of meat coupons). Put two pounds of brisket into a deep pan, cover the meat with cold water, and bring it slowly to the boil. Skim off all fat. Fry two sliced onions brown; cut up finely a small cabbage and two carrots; add these, with salt, minced parsley, and herbs to taste, to the brisket, and simmer quietly for three to four hours. Have two tablespoonfuls of rice boiled in half a pint of milk and water, until the liquid is absorbed and the rice tender. Mix in two ounces of shredded cocoa butter (or suet) and one dried egg, with a few chopped dates or a little sugar, and steam them in a greased basin. 2 oz flour, 4 oz soaked bread, 6 oz suet, salt, spice, 4 oz sultanas, 2 oz peel, 1/2 lb apples, 2 oz grated carrot, 1 dried egg, 1/2 gill milk, 2 oz treacle, half a lemon. I’m familiar with many contemporary cookbooks and histories but this is the first time I’ve seen reference to “dried egg” in WW1: I’m not sure that it would have been in common use then? 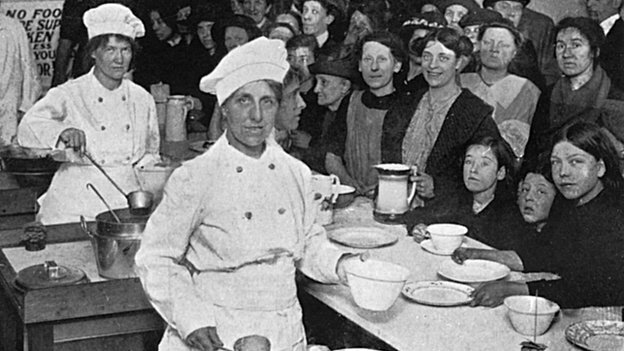 Were there formal ration cards and rigid food restrictions in WW1, as there were in WW2? lived in the countryside still had food. These are great recipes. I didn’t realize there actually was a WWI Cookbook. Your posts are always so interesting. I’ve come across my fair share of cookbooks published during WWI, either for housewives dealing with rationing or for invalid diets in hospitals. Another great book that has been reprinted, is Feeding Tommy by Andrew Robertshaw–it’s full of information about army cooks and recipes taken straight from the diary of army cook.